Tying directly into Virgin Games TV campaign these live streams give Vlad the vampire a different job which in each case isn’t quite as exciting as he had hoped. In both these Facebook Live streams, Car Park Poker and Hi/Lo Turkey, Vlad is making life more exciting by taking his dull job as car park attendant and meat counter worker respectively and gamifying them. 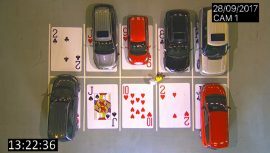 Car Park Poker saw Vlad put playing cards on each parking space so the viewer’s hand of poker was made up of those cards which didn’t have a car parked on them. Players watched for the highest hand through Vlad’s CCTV system on Facebook Live, and called out in the comment section to try and win £5000. In Hi/Lo Turkey, viewers had to predict whether the next turkey weighed by a customer at the supermarket meat counter would be heavier or lighter than the previous one. The person with the longest correct streak in the comments section won £5,000, with a number of smaller prizes up for grabs as well. Both live streams were enjoyed by tens of thousands of people on Facebook and generated hundreds of new followers for Virgin Games as well increased traffic on the related pages of the site. The campaign was enabled by our unique competition tool which allows us to deliver complex multi-round competitions over Facebook live with 100,000s of viewers taking part.